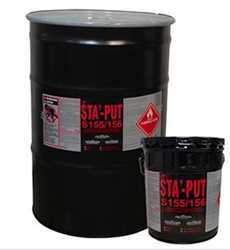 STA’-PUT® S155/S156 is the “Metal Bonder”. It has a full hour of open time. It is a solvent-based, high solids contact adhesive that is also formulated for versatility in bonding a wide variety of materials including decorative laminates, plywood, particleboard and rigid plastics. S155/S156 offers a wide fan spray pattern, quick tack, and excellent green strength. S155/S156 also exhibits high solids which give extended coverage and lower cost per laminated foot. S155/S156 is an excellent postformable, high heat resistance yet economical “bargain” adhesive.